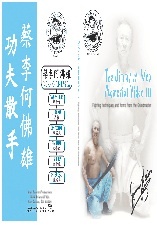 This DVD is filled with never before seen footage of the Grandmaster teaching techniques, philosophy, forms and character of the art. Color. Approximate run time 35 minutes. Pleasant Hill Publishing was founded in 2009 and is located in Northern Colorado. We specialize in the reproduction of authentic Kung Fu San Soo historical items. You can either send in our order form or, you can order today using Pay Pal Secure Ordering . Just click the button associated with the product you want to purchase. 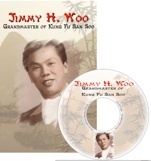 This 224 page book published by Pleasant Hill Publishing is filled with stories about the Grandmaster of Kung Fu San Soo during his early years in China. With rare photos and some of Jimmy’s favorite recipes. Forward by Raul Ries. All contents on this page are © 2009 Pleasant Hill Publishing. All rights reserved. No content including words, photos or images may be used without express written permission from Pleasant Hill Publishing, P.O. Box 575, Loveland, CO 80539. A new 40 minute video of the Grandmaster teaching lessons and techniques in a way that was unique and thorough. A wonderful memorial to The Grandmaster of Kung Fu San Soo. A new 40 minute video of the Grandmaster teaching lessons and forms in a way that only The Grandmaster could. This is a must have! Don’t miss out as supplies on this are limited.